Get Lifetime Access Now. One Payment - No Recurring Charges! The Free Trial period is 15 days. When the trial period is over, you will no longer have access to the houses you've created and you won't be able to create new ones. Subscribe now to get uninterrupted lifetime access for one payment of just $99. NO AUTOMATIC RECURRING CHARGES - one payment gets you unlimited access and all upgrades. Save as many houses as you want and access the Home Remodeling Cost Calculator as much as you'd like. There's no additional usage or volume fees. As a registered client, you'll have access to new modules as they become available and all of your data is securely stored. Unlimited downloads of my After Repaired Value Calculator and Offer Calculator are also included with every purchase. Gain confidence and eliminate the uncertainty that comes with of buying distressed properties—all for $99. If at any time you don’t feel as though you got a great value for your one-time payment of $99, let me know and I will refund 100% of the purchase price. No “restocking or processing fees” or other games. I want all my customers to be totally satisfied. Take it with You On Your Tablet! 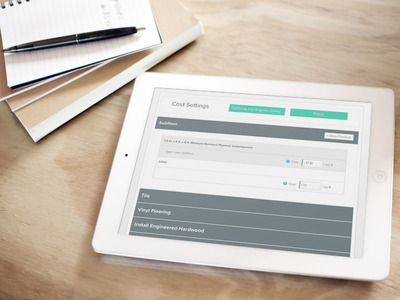 Generate Repair Cost Estimates Instantly – As You Walk through the Property!